This... this must be a troll haha this is a troll come on... this is a troll right o.O? Might be hidden OP. Can imagine stealth minion into this+ windfuryy buff Mega windfury is super dangerous. It shouldn't work with cards that you used windfury on them I think if it does it has potential if it doesn't well either pack filler or next sets support. So turn 6 junlepanther, turn7 buff it with windfurry some bananas turn 8 this or eureka + 3 attackspell for over 40 damage????!!!!! What were they THINKING??????? 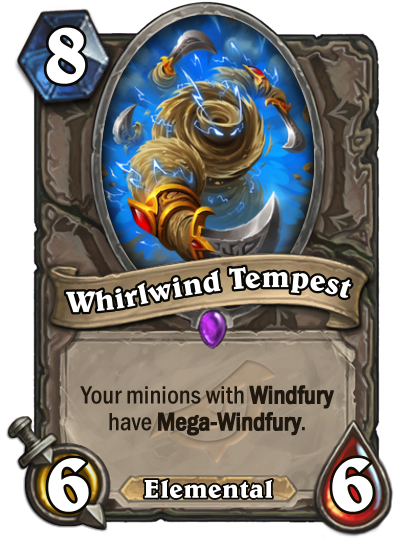 It does, otherwise it would say "windfury minions" not "minions with windfury"
I mean it could be a finisher for a board heavy deck. In a deck like that often you'll have something on board and the shaman windfury card plus this is just 3 extra attacks on any minion which could win the game. I actually love that they never give up on windfury. Keep on trying, little tornado friends! Turn 10, Muckmorpher > this + Muckmorpher > Al'akir ? Eureka in case you draw them? Or this + Windfury card on any big minion. On a 8 atk minion it is 32 damage for 10 mana. This will be a sleeper card for sure. Mega findfury is super strong mechanic. We just need to find an efficient way to cheat this out and get some mega windfury stuff going. Shaman most likely. I don't care if it's unplayable. Everything about this card is awesome. Shaman card that gives windfury to a stealth minion. Next turn play this gg. First thought: its stupid but cool. This is definitely going to otk people. I'm not sure how yet but it will.